The Well-Appointed Catwalk: Win my IFB Swag! How could I have forgotten? I brought back something from New York for you! Well, for one of you anways. 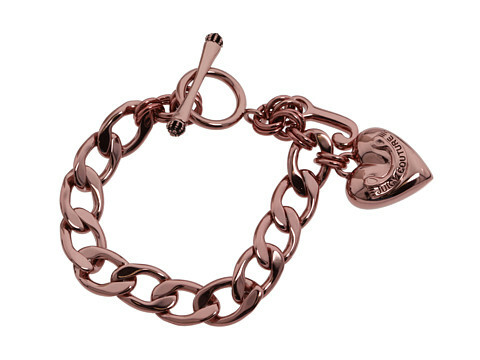 The swag bags from the IFB Evolving Influence conference were pretty sweet - MAC makeup, a Shopbop coupon and this pink Juicy Couture charm bracelet, among other things. For those of you who couldn't make it to New York, I figured I would pass the bracelet on with a giveaway. To enter, just follow me with Google Friend Connect (to the right) or bloglovin' and leave a comment below. I'll announce the winner on Wednesday the 23rd. Good luck! Now that's a great idea! Just commenting (not entering) since I already have that bracelet too. How sweet of you! I hope i win this because I LOVE IT! Holla- I'm a happy follower and I LOVE this! Crossing my fingers! Well you know I already follow you (!) so if this is open internationally (or more specifically to the UK) I'd love to be entered. How fun, count me in. And of course I follow. I am now following (although I thought I already was, oops, guess I was anon!) I am so determined to get the money to go to NYFW someday.. would be amazing! i wish i could have gone to the IFB conference..maybe next year! This is beautiful- I love the copper finish. I am a follower and love this bracelet. Soooooo pretty! I like coppery color. It makes it less traditional. That is sooooo sweet of you! I deseperately wanted to make it to NYC, but alas it was not meant to be...yet! That is nice swag!! You're so nice to give it away! i want to winnnnnnnnnn!!! pick me! pick me!! Yu got to come to New York the attend the IFB conference. I could not attend it because of a conflicting schedule. Hope to make it next time. The bracelet is really charming.